I’ve noticed this year a bit of an underwhelmed attitude when clients come to me to commission flowers for events. I get the feeling some people view flowers as an obligatory accessory. Or perhaps people feel weird about spending on a luxury when money is tight. I totally get that, flowers are luxurious. 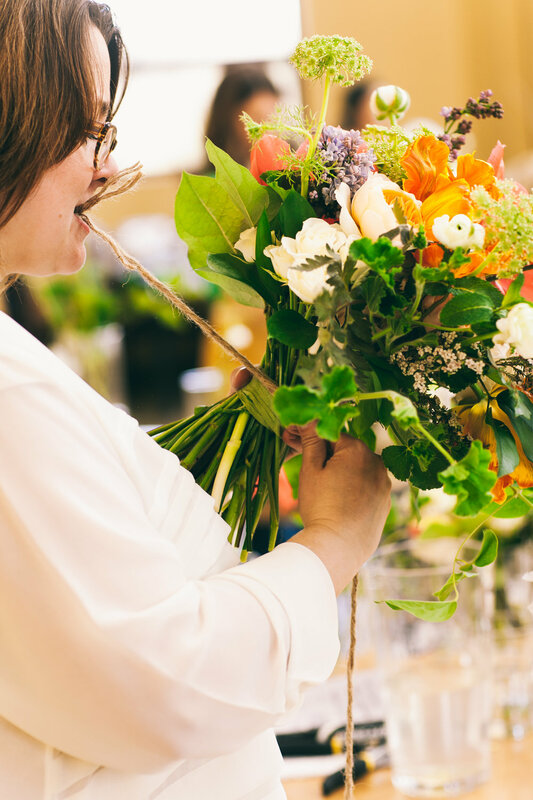 But when you are planning an event, or more importantly THE event, you may want to consider what the flowers are doing for you. I don’t know if it’s the fact that I'm on my second coffee of the day, the inspiring episode of Ugly Betty I saw, or the wonderful meeting I just had with two new colleagues, but I’d like to help change the underwhelmed into the overjoyed. What am I doing when I design your flowers or event? I am pulling out the meaning of the event, pulling out the meaning of you, surrounding it by petals and putting it out in front of everybody. Sound exposing? It should be. You should be able to look at the flowers and think, Yes. That is me/us/ this. Or just cry, that is fine too. Not rented, not borrowed but grown in dirt, cared for by good people, cut, carefully handled, and brought to you- sometimes from far away. Luxurious, yes. But in celebration of an event worthy of affecting people emotionally? I argue it’s essential to do it right. What grabs attention and draws you in a room? Flowers. You walk over to get near them. Once your attention is brought down to the scale of a flower, and its particular texture and shape, everything changes. Everything becomes something to be touched, something that stands out from its surroundings. People start appreciating things like corners of lips and eyelashes. The weave of a tablecloth suddenly becomes something worth looking at and you realize, this is special. Not necessarily the flowers, but the here and now. This place, these people, near me. This is beauty. Flowers are the ultimate here and now celebration. Picked from some place with a feel all its own, maybe a sun filled field, and brought to you to live out its life with you, where you are. They are orchestrated with other flowers and decor specifically to connect with you- to connect you to here. Flowers slow you down and remind you that now has a beauty that’s up for grabs. What is there to be indifferent about?